Madeleine Mitchell, described by The Times as ‘one of the UK’s liveliest musical forces (and) foremost violinists’, has performed in a wide repertoire as a soloist and chamber musician in 50 countries, in major festivals including the BBC Proms, and is frequently broadcast for radio and TV. She was recently Artist-in-Residence at the Canberra International Festival and last year’s engagements included Moscow, Singapore, Vienna, London’s Wigmore and Barbican Halls, Dartington (with a return invitation this year), China and a major tour of the USA. Madeleine has performed concertos with orchestras including the St Petersburg Philharmonic, Czech and Polish Radio Symphony, Wurttemberg and Munich Chamber, the Royal Philharmonic and other London orchestras, Orchestra de Bahia Brazil and for the BBC. Many well-known composers have written works for her and in May she returns to the Vale of Glamorgan Festival to perform Guto Puw’s new violin concerto with the BBC National Orchestra of Wales. In recital Madeleine represented Britain in the festival UKinNY at Lincoln Centre, the Queen’s Jubilee in Rome, ‘Great British Week’ in Kuwait and has given recitals at Sydney Opera House, Seoul Centre for the Arts and Hong Kong – part of a three-month world tour. 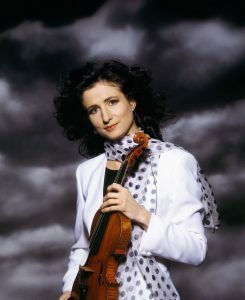 Madeleine’s acclaimed discography includes ‘Violin Songs’ – Classic FM’s featured CD; two albums of works written for her including by MacMillan and Nyman: ‘In Sunlight’ and ‘FiddleSticks’ (with Lou Harrison Violin Concerto) – nominated for Grammy and BBC Music Awards; Naxos albums of Alwyn and Howard Blake; ‘British Treasures’; Hummel sonatas; and Messiaen Quartet for the End of Time with Joanna MacGregor. Her recent CD of MacMillan with Cappella Nova was BBC Music Choral CD of the Month, Madeleine devised the Red Violin Festival in Cardiff under Lord Menuhin’s patronage, the first international eclectic celebration of the fiddle across the arts, for which she was shortlisted for the European Woman of Achievement Award. She is Director of the London Chamber Ensemble, Professor at the Royal College of Music and on the faculty of www.lmfl.org summer courses. Madeleine was born in Gidea Park, where her family still lives, attended Hornchurch Grammar (now Emerson Park Academy) and led the Havering Youth Orchestra, playing alongside some current members of the Havering Concert Orchestra. She has frequently supported Havering Young Musicians, donating a prize, giving workshops and appearing as soloist with them in the Queen Elizabeth Hall in a work written for her by Michael Nyman, Havering Music School Patron.